The combat racing game allows users to collect more than 60 vehicles and race against other players in real-time four-player events. 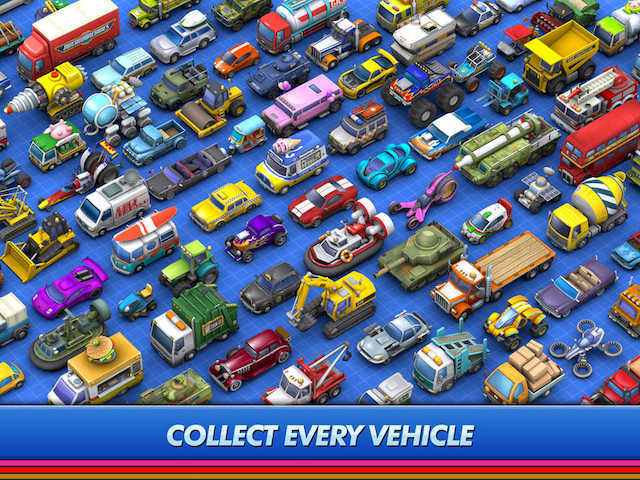 Chillingo announced the worldwide release of Micro Machines on iOS. The combat racing game allows users to collect more than 60 vehicles and race against other players in real-time four-player events. Micro Machines includes three gameplay modes: classic races, elimination races and battles. During each event, players can collect presents in the environment containing either weapons they can use to damage other users’ vehicles or helpful boosts. While the classic race and elimination modes see users drive around race tracks, the battle mode takes place in an arena-style setting and challenges players to simply destroy other vehicles, rather than race. Gamers can collect coins as they participate in events. While players begin with access to Tier 1 vehicles, they’ll unlock additional vehicle tiers and vehicles as they progress. Specifically, players can purchase packs of vehicle parts, and they will unlock new vehicles as they collect their required parts. When users collect duplicate parts, they can spend them (along with coins) to purchase the specific parts they need. Coins can also be used to purchase packs of vehicle parts and to upgrade the stats of individual vehicles. As players upgrade their vehicles, they’ll eventually be able to purchase mods for their vehicles, which improve their abilities. Each vehicle will generate coins each day, with modded vehicles generating more coins. As players complete races, they’ll earn trophy points, which can help them climb the in-game leaderboards and earn prizes. Users can also complete goals to earn extra prizes, including premium currency (used to purchase packs of vehicle parts, among other items). Finally, gamers can join clubs with other users and complete special club goals to receive prizes each week. Micro Machines is available to download for free on the iTunes App Store.